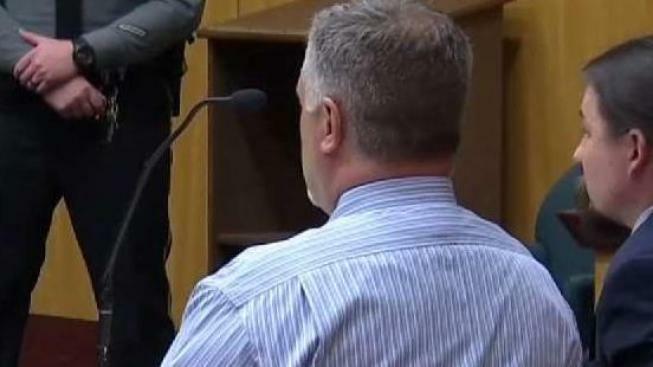 A jury trial is now underway in a high profile patient abuse case a story broken two years ago by NBC Connecticut Investigates. Former forensic nurse Mark Cusson is facing 16 criminal charges, accused of abusing Whiting Forensic patient Bill Shehadi, with the alleged acts all caught on surveillance video. Dr. Michael Norko, a top administrator with the Department of Mental Health and Addiction Services, described video evidence of the alleged abuse of Whiting patient Bill Shehadi, by now former forensic nurse Mark Cusson. “I saw him pour water on his head, take a mop that he had just used to mop the floor and then mop his head with it”, Norko said. Surveillance of Shehadi was set up around 2000, to substitute, at times, for having two staffers in his room with him. “Watching him constantly all the time was intrusive, and may have been causing him more problems,” Norko explained. Cusson is among 10 former Whiting Forensic Division employees arrested in connection with the abuse. Shehadi is a patient in his 50s, committed to Whiting decades ago for the murder of his father. He is described as possibly the most difficult patients at Whiting. The defense tried to show the jury that Shehadi is a patient not easily handled by the standard restraint and de-escalation techniques, and that Cusson often did not get a great deal of support from management in dealing with patients like Shehadi. Patient advocates tell us Shehadi’s issues are still no excuse for the treatment he received.